Bluegrass Pundit: Sen. Lindsey Graham on recent election: "There's ample evidence of fraud,"
Sen. Lindsey Graham on recent election: "There's ample evidence of fraud,"
If you thought he was talking about Mississippi, you are wrong. 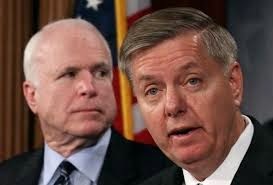 Graham and McCain are fine with fraud there. It's election fraud in Afghanistan that has them concerned. Less than a week after allegations of fraud prompted election officials in Afghanistan to delay the results of that country's presidential runoff election, Sens. John McCain, R-Ariz., and Lindsey Graham, R-S.C., called Friday for the two remaining Afghan candidates to allow the results to be audited. "There's ample evidence of fraud," said Graham, according to the Wall Street Journal. "There needs to be an audit that is recognized by the Afghan people as legitimate and by the international community as legitimate." A failure to end the standoff, McCain warned, "could put not only the political environment in Afghanistan into a crisis, but also weaken American support for the continued process" of helping Afghanistan as the country recovers from more than a decade of war.